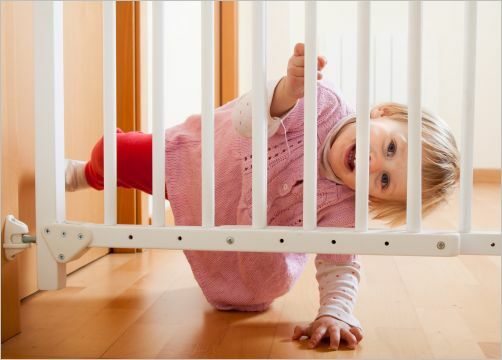 Do You Make These Mistakes In Child Proofing Your Home? How much effort have you put into child proofing your home? A well child proofed home makes for a happy, safe child and happy, unstressed parents. A house that is not adequately child proofed means junior is always getting in trouble—or danger—and mom and dad are wearing themselves thin trying to grab him back from everything he shouldn’t get into; trying to protect him, the computer, and grandma’s antique vase. So what does childproofing your home really mean? It means making your home into a place that your child can play and explore within normal limits without hurting either himself or the house. Of course, even in the best child proofed house, troublemakers can get into trouble. That’s where mom and dad come in, and that’s why we don’t leave two year olds alone in the house to babysit themselves. But if your house is adequately child proofed you should be able to relax on the couch without worrying about the little guy playing beside you in the room, just outside your line of vision. When he dashes across the room, you shouldn’t have to dash up too. What are the key areas you should look at while child proofing your home? What are the areas of potential highest danger? A great deal depends on the age of your child. A house will need to be child proofed for a crawling baby differently than for a romping toddler, and a six year old needs still different treatment. Of course, if you have multiple children of different ages in your house, you have to child proof for them all. When child proofing your home, try to look at the house with a child’s perspective in order to see what might be tempting—that is to say, what might be a major problem area. If you’re childproofing for a crawler, get down on your hands and needs and crawl through the house. If you’re childproofing for a toddler, get down to your toddler’s level. Anything that would be poisonous to your child if ingested in any quantity should never be left out, but also should preferably have at least two levels of protection instead of one. If you have a choice between a locked medicine cabinet at your child’s eyelevel or a higher one you can also lock, chose the higher one. Buy medicines that come in tamper-resistant bottles—bubblewrapped sleeves are easy for a child to get into. But even if the bottle is tamper-resistant, put it right back in the locked medicine cabinet after using it. One important aspect of child proofing your home is to store cleaning supplies in their original bottles. Never put bleach, cleaning supplies, paint, motor oil, or any other potentially poisonous substance in a soda bottle or another container your child might associate with food and drink. Guns are one thing which excites the imagination of any child, and experimentation can lead to disaster in a matter of seconds. Guns should never be within reach of children; even if you are sure they are unloaded. Keep them safely locked away in a childproof safe and avert tragedy. Electric stoves are dangerous to children because the electric burners retain their heat for a long time after they are turned off. If your little one is just at the height where he or she can reach up and touch the burner, you should consider investing in a stove guard that keeps her little hands safe. If the knobs are easily turned by a little person too young to fully understand no, make a practice of unplugging the stove whenever you aren’t using it. A heavy bookcase falling onto your climbing toddler could put him in the hospital for a long time. When child proofing your home, test all your furniture for stability and if there are any pieces that seem they might be liable to tip, put up sturdy wall brackets that keep them in their places. Electricity is especially dangerous for small children who love to stick their fingers anywhere they can. If they stick them into the holes of an outlet, they can get badly shocked. Outlet covers with safety features such as auto-locks can keep your child out of electric danger. 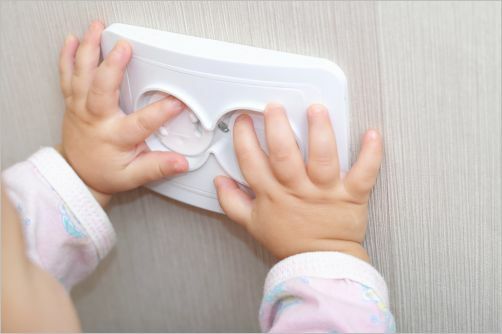 These are available cheaply at most home improvement stores; buy and install on any outlets within reach of your little one when child proofing your home. You don’t want to miss the forest for the trees when child proofing you home. Though you’ll have lots of little details to work on, keep the big picture—keeping your little one safe—forefront in your mind as you work, and be alert to dangers that may come in a wide assortment of shapes and sizes.